Individual instruction for academic credit (private lessons) in piano (classical), organ, woodwind, brass, percussion, string instruments, and voice is available to all University students regardless of major. However, as individual lessons represent a course taken for college credit, students taking private lessons are generally experienced performers on their instrument or voice. Music majors are given priority for all lessons instructors, but music minors and non-majors are also welcome, based on the availability of the faculty. Registration for all applied lessons is by permission of instructor (or audition). Instructor contacts and registration procedures are outlined below. The Department offers four types of applied lessons: individual lessons at the 1XX level (0.5 or 1.0 credit hours), 2XX level (2.0 credit hours), and 3XX level (3.0 credit hours); and group lessons (1.0 credit hour) at the 1XX level. (Full details are available in the Undergraduate Bulletin.) Individual lessons instructors will assign students to the appropriate level of lessons based on their degree program and musical proficiency. Lessons at the 1XX level are generally taken by music majors pursuing the B.A. degree, music minors, and non-majors. Students may enroll for 1XX lessons for 0.5 or 1.0 credit hours, subject to instructor availability. Lessons at the 2XX level are generally taken by music majors pursuing the B.M. degree and appropriately qualified students pursuing the B.A. degree or music minor. Students enroll in 2XX lessons for 2.0 credit hours, which encompasses a weekly one-hour lesson as well as a weekly studio class. B.M. students normally enroll for eight semesters of 2.0 credit lessons on their main instrument. 3XX level lessons are reserved for students pursuing the B.M. or B.A. degree who wish to include a recital in their applied study. Students enroll in 3XX lessons for 3.0 credit hours. 3XX lessons substitute for 2XX lessons in the recital semester, and may be taken in up to two semesters during a student’s degree program. Lessons at the 3XX level have a prerequisite of six hours of the equivalent MUSC 2XX course. Group applied lessons are designed for less experienced performers desiring to expand their proficiency in a particular instrument or voice. Students enroll in these 1XX level lessons for 1.0 credit hour, and group lessons meet once per week for 90 minutes. Presently, group lessons are offered in guitar, piano, and voice. All students enrolling for applied lessons must do so during the regular University registration period at the beginning of each semester. 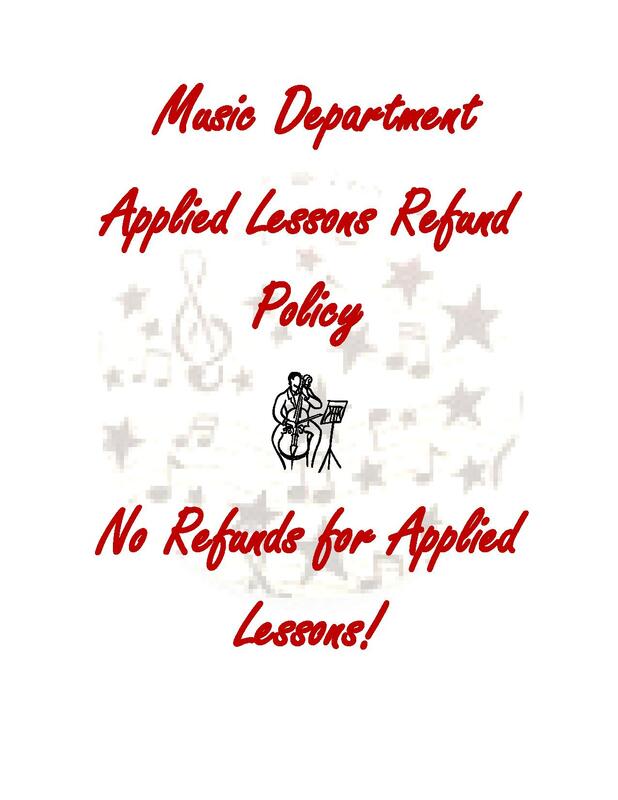 Students desiring to register for lessons should complete the following steps. For students taking 1XX level lessons (MUSC 100-106, MUSC 110-112), complete an Applied Music Registration Form and submit it to the Department Registrar, Angeline Warren, in Hill Hall 105A. Forms can be obtained from the Department registrar, Department main office (Hill 105), or from your lesson instructor. This form includes a section for you to complete, as well as one for your lesson instructor. Careful completion of this form is pivotal to ensure accuracy in your lesson registration and billing for the applied lesson fee. The Department Registrar will register you for the appropriate course when you submit your Applied Music Registration Form. Even so, you are responsible to confirm your registration for the appropriate course. For students taking 2XX and 3XX level lessons, register for your applied lesson course on Connect Carolina. Note that applied lesson courses are arranged in sections by instructor, and students should be sure to enroll with the correct instructor. Separate fees beyond normal tuition are required for private instruction. These fees are the cost per semester, and are billed by the Department Registrar at the end of registration each semester. Unless otherwise requested, applied lesson fees are billed to your student account. 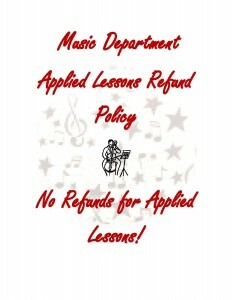 There are no refunds for applied lessons. Prices are effective Fall 2018.